A unique sunblock formulation, based on the latest Nano technology, it is desighned to deliver sun-protective properties deep into the skin. 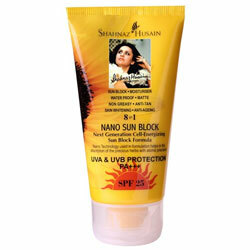 Of SPF 25 it provides broad spectrum protection from the suns UVA and UVB rays. Containing natural antioxidants and rehydrants, like vitamin E, green tea, carrot seed,ginseng, sunflower oil, it blocks out harmful sun damage, maintaining the desired moisture level, removing tan and visibly lightening skin colour. A non- greasy formulation, it provides a smooth matte texture, leaving the skin soft, radiant and youthful. Apply on face, neck and arms 20 minutes before sun exposure. Leave on.